Commercially available disposable plastic pipette tip with the inner diameter of ca. 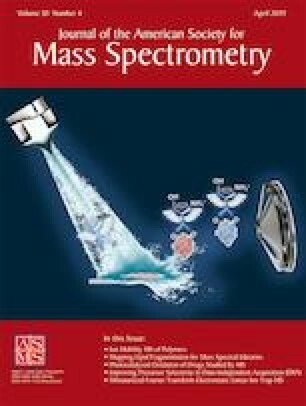 120 μm in series with a high-ohmic resistor (10 GΩ) was adapted as a low-cost alternative ion source for high-throughput nanoelectrospray mass spectrometry (nESI-MS) analysis of a variety of samples, especially aqueous solutions, without sample pretreatment. The use of high-ohmic resistor enabled the formation of stable electrospray of aqueous solutions at ambient conditions. In addition, corona discharge was avoided even with a high voltage applied. Quantitative analysis of vitamin B in water was successfully conducted by tip-ESI. The results exhibited a good linearity (R ˃ 0.9983), a low detection limit (0.25 ng/mL), and a wide dynamic response range (0.25–1000 ng/mL). Our study revealed that tip-ESI not only performed equally well to capillary nESI in terms of flow rate (˂ 100 nL/min), signal sensitivity, and sample consumption, but also offered a number of additional advantages, including better signal duration, tolerance to high analyte concentration (> 100 μg/mL) and high ionizing voltage (up to 6 kV), and obviation of tip clogging and corona discharge. High compatibility of tip-ESI with various kinds of samples (aqueous, viscous, solid, or bulk biological samples) makes it a promising tool for direct MS analysis. The online version of this article ( https://doi.org/10.1007/s13361-019-02142-5) contains supplementary material, which is available to authorized users. A correction to this article is available online at https://doi.org/10.1007/s13361-019-02188-5. This work was supported by the National Key Scientific Instrument Development Projects (2011YQ14015008), Department of Science and Technology of Jiangxi Province (No. 20165BCB19013), Program for Changjiang Scholars and Innovative Research Team in University (PCSIRT) (No. IRT13054 & IRT17R20), and International Science & Technology Cooperation Program (No. 2015DFA40290).